The FTSE 100’s record high barely beats the level of 1999, yet investors have been richly rewarded, highlighting the power of dividends. Reinvesting dividends is one of the most powerful tools available to an investor to boost returns over time. If you had invested £100 on 30th December 1999 in the FTSE 100, the capital growth would have produced a notional return of £1.20 (by 14/10/16). But on a total return basis, reinvesting all dividends, the £100 investment would now be worth £181.20. A dividend is a payment to shareholders, typically made twice a year, by a company out of its profits. They have become increasingly important to investors, who are unable to find decent income from more usual sources, such as corporate bonds and savings accounts. This is due to measures deployed by central banks – low rates and quantitative easing programmes – designed to revive flagging Western economies. It means high dividend-paying stocks are very much in fashion. 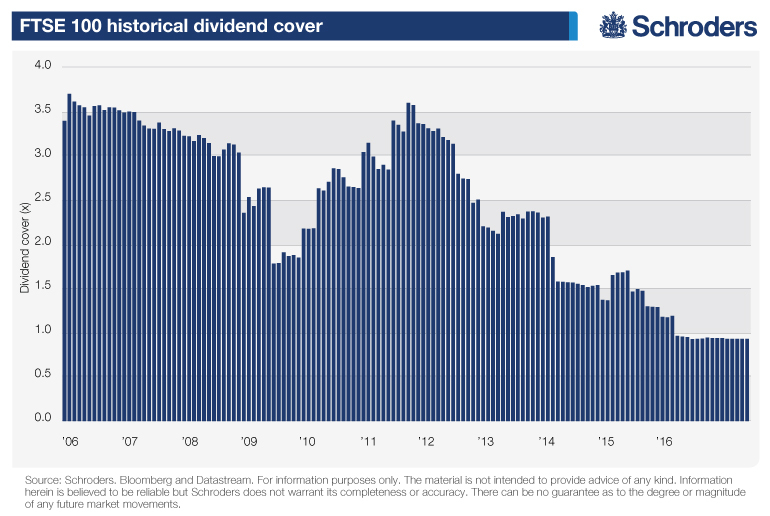 With dividends in the spotlight, we explain how they have worked in enhancing returns. This is true for investors the world over, but we focus on one particularly startling example – the FTSE 100. When purchasing a share, investors can elect how they will receive any future dividends. They can choose between receiving the cash, or instead, using that money to repurchase more company shares. When opting for reinvestment, the investor triggers the start of a process Albert Einstein called “the eighth wonder of the world”: the miracle effect of compounding interest. The chart compares two returns of a notional FTSE 100 investment over the last 16 years. 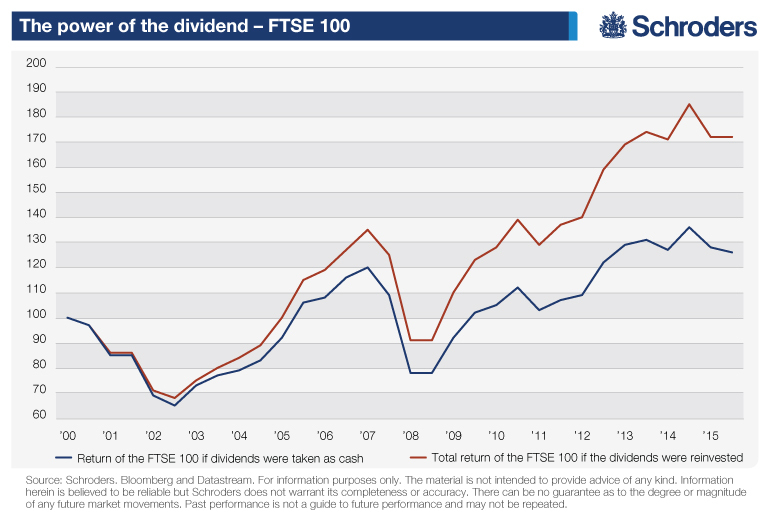 The (blue) line shows the return investors would receive if dividends issued by FTSE companies were taken as cash. Since 2000, a 26.2% return would have been made, equating to a Compound Annual Growth Rate (CAGR)1 of 1.42%. In comparison, had the investor reinvested these dividends to re-purchase shares, “total return” (red line) would have been 72%, providing a much greater CAGR of 3.36%- almost 2.5 times the rate offered on a cash return basis. This compares with negligible capital growth for the FTSE, which is at 6948 on 17/10/16 compared to that 6930 high in late 1999. At an individual stock level, the same is evident. 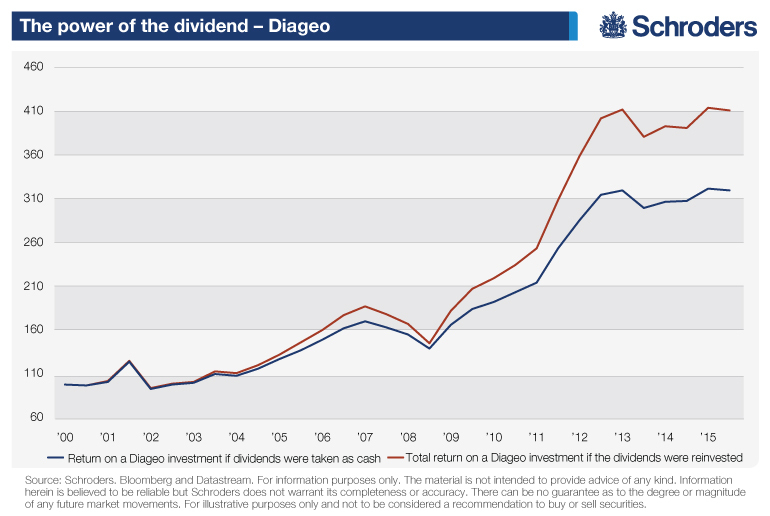 Taking the drinks giant Diageo as an example, say we had invested £10,000 in the year 2000, all dividends taken as cash added to our existing shareholding would be worth £32,100 (7.4% CAGR). However, if we’d have opted to reinvest, our current shareholding would be worth £41,200 (9.02% CAGR). These examples clearly show the power of dividend reinvestment. Both show that by buying additional shares, your initial capital increases through compounding, which could help protect your initial capital outlay. Later losses could be partly absorbed by this buffer. And the buffer increases exponentially over time if the share appreciates in value. In these examples it’s obvious to see why many investors look for high-yielding dividend stocks. However, those thinking this will offer a simple silver bullet to growing wealth should tread with caution. If only investing was so simple. Although paying a dividend is a discretional management decision, companies usually seek to maintain a level of payout in line with market expectations. Because of this, management can fall into the “dividend trap”, feeling forced to distribute cash to shareholders, when in reality it may be better for long-terms returns to reinvest the money in the business, in activities such as research and development (R&D). One common way to assess the suitability of a dividend payment is by calculating dividend cover. By dividing the companies profit after tax by the dividend payment we can assess the firm’s ability to distribute profits. A dividend cover of three is considered sufficient whilst anything below one suggests serious vulnerability. It means the company is essentially paying out more than it has earned, which is unsustainable. Is the FTSE running out of cover? As yields in the bond markets have fallen to historic lows, many investors have turned to stocks, using the dividends as a replacement to bond coupon payments. This year the market has seen record high dividends distributed to investors. Morningstar reported that in the second quarter of the year, a record £28.8bn of dividends were paid, with the FTSE yielding just under 4%. Further weakening of the pound has boosted company earnings. Given that two-thirds of index constituents’ earnings are from outside the UK, even greater payments could follow in the months ahead. However, many observers are highlighting a sharp fall in the FTSE’s dividend cover, from a healthy high of 3.61 in the autumn of 2011, to an alarmingly low 0.93 today. This implies that across the index, firms are paying more cash out to shareholders than they are actually making in profits. History has shown that this can be to the detriment of longer-term shareholder value. Should this trend continue, firms will be forced to cut their distributions which can cause a reduction in share price. Where valuation has fallen faster than earnings a dividend yield actually increases. Investors should therefore treat high-yielding stocks with caution, and fully investigate the underlying investment case for that business. The secret lies in being able to assess the sustainability of dividend distributions. Looking at the companies’ cashflow to judge how comfortably the company can pay a dividend is one way. Looking at the dividend history and the industry’s track record can also be valuable in building a picture of the future. This is the sort of analysis undertaken by an income fund manager. 1. The compound annual growth rate (CAGR) is a useful measure of growth over multiple time periods. It can be thought of as the growth rate that gets you from the initial investment value to the ending investment value if you assume that the investment has been compounding over the time period. The above article was first published by Schroders on 21st October 2016. Previous Previous post: Should we worry about Japanese debts?